The title page in the Twentieth Century Playbill. Eugenie Leontovich, a Russian import who originated Garbo's role in Grand Hotel on Broadway, stars opposite Moffat Johnston in a new Ben Hecht and Charles MacArthur comedy Twentieth Century based on a play by Charles B. Milholland. The three-act work, which includes a cast of more than two dozen set aboard the Chicago-to-New York title train, opens Dec. 29 at the Broadhurst Theatre as staged by George Abbott. Eugenie Leontovich and Moffat Johnston's bios. In the Playbill, among advertisements for cars (the "larger, longer, lower" 1933 Buick or the Chevrolet Sedan priced at $565), women's fashion ("full-fashion" brassieres, shoes, hosiery), perfumes, jewelry and plenty of cigarettes is a full-page listing for "New York's Leading Theatres and Attractions." 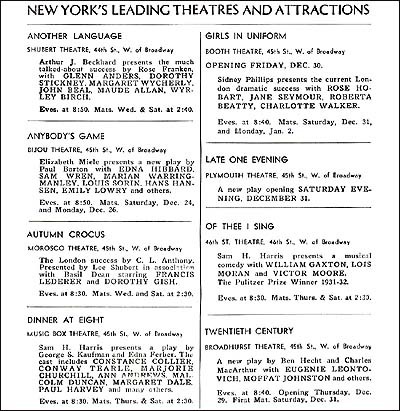 Shows also "On the boards" of Broadway in 1932. 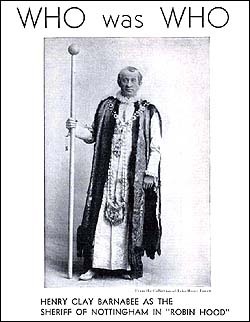 Editorial featured in the Playbill include a feature on London theatre, "What the Woman Will Wear/What the Man Will Wear" fashion previews, as well as a "Who Was Who" (part of an ongoing feature series looking back at actors and their famed roles) focused on Henry Clay Barnabee as The Sheriff of Nottingham in Robin Hood, in which he is quoted "I have plotted with him and induced him to become intoxicated so many times that I really feel ashamed of myself." 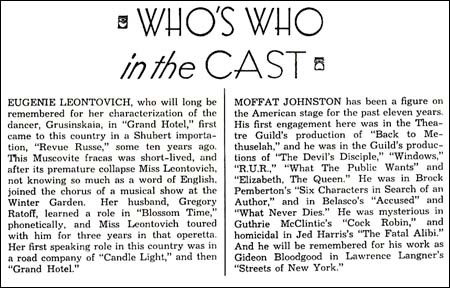 The Playbill "Who Was Who" feature. According to theatre historian and Playbill archivist Louis Botto, "The play [Twentieth Century] was considered kind of scandalous because it was so obviously about [producer] Jed Harris." The impresario was reviled by many in the theatre community, recalled Botto. "[Playwright-director] George S. Kaufman hated him and once said when he died, he wanted to be cremated and have somebody throw his ashes in Jed Harris' face. Laurence Olivier, [who] was directed by Jed Harris in that famous 1930s play The Green Bay Tree, hated him so much that years later when he played the evil Richard III, he said he based his whole character on Jed Harris." Press agent Richard Maney, who long represented Harris, and knew Hecht and MacArthur, said in his autobiography that the role of Jaffe did indeed ape Harris, but also drew on the characters of producers Morris Gest and David Belasco. Interestingly, it was Harris who first commissioned Hecht and MacArthur to write the comedy. The comedy would later make the leap to the big screen as the 1934 film — a popular yardstick for success in the pre-Tony Awards period — starring John Barrymore as the Broadway producer Oscar Jaffe and Carole Lombard as his former protégé-turned Hollywood starlet. The play, revived on Broadway in 1950 starring José Ferrer and Gloria Swanson, would also serve as the basis for the 1978 Betty Comden, Adolph Green and Cy Coleman musical starring John Cullum and Madeline Kahn. Younger performers in that cast included Kevin Kline, Craig Lucas and Judy Kaye.